The Pacific Marine and Estuarine Fish Habitat Partnership (PMEP) works with its partners to assess conditions of the estuarine and nearshore environment along the West Coast. In many cases, the group has gathered and synthesized existing data into a singular consensus scheme in order to allow for comparisons across a region or regions. Habitat managers need better information about fish use and habitat condition within these systems in order to make informed decisions. PMEP will continue to identify key topics needing additional assessment knowledge and will work to create tools and reports that help get this needed information into the hands of restoration practitioners and habitat managers along the West Coast. Eelgrass, a type of marine flowering plant, can serve as a biological indicator of ecosystem health and is threatened by numerous human activities. 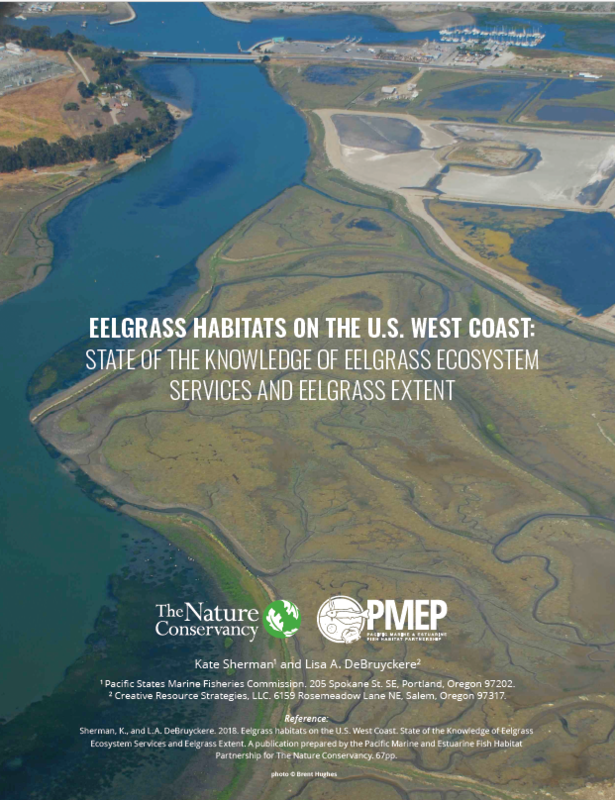 This report provides a synthesis of the state of scientific knowledge of U.S. West Coast eelgrass habitats and the ecosystem services they provide, as well as identifies knowledge gaps for future research. As part of this assessment, available data showing the presence and extent of eelgrass along the West Coast was compiled into a geodatabase. 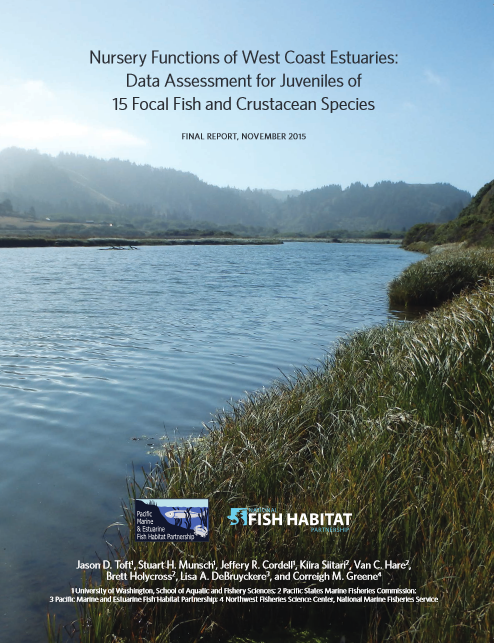 The assessment addressed the status of estuarine use along the West Coast for 15 “focal” fish and crustacean species. These species’ life histories span all or a significant portion of West Coast estuaries. The overall objectives of the assessment was to synthesize the available data into a common format allowing for (1) creation of maps displaying species location, average frequency of occurrence, and average catch per unit effort (CPUE), and (2) comparison of the data, using the best quality portions of the dataset, to presumed habitat impacts measured by estuarine stressor scores. 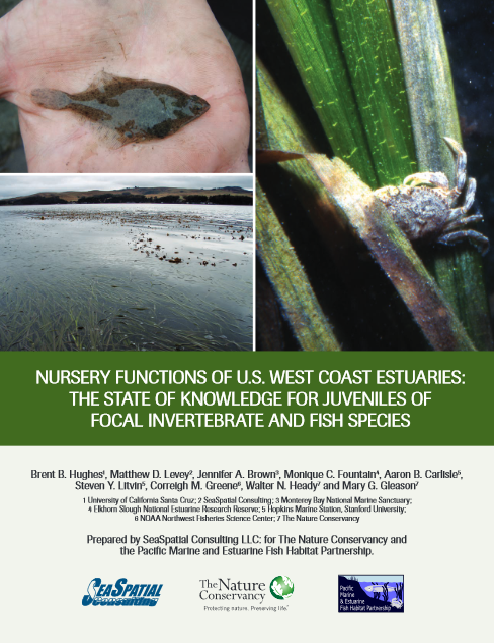 This report expands upon previous efforts summarizing juvenile use of estuaries and synthesizes the existing geospatial data and information on the nursery role of estuaries for a group of ecologically and economically important fish and invertebrate species. It aims to synthesize: 1) important and emerging threats to the nursery functions of West Coast estuaries, 2) tradeoffs associated with the management of habitats for species specific nursery function, 3) knowledge gaps and 4) potential management actions to conserve or restore nursery function. The review showed that despite good information demonstrating the importance of estuarine nurseries for some species, significant knowledge gaps remain. 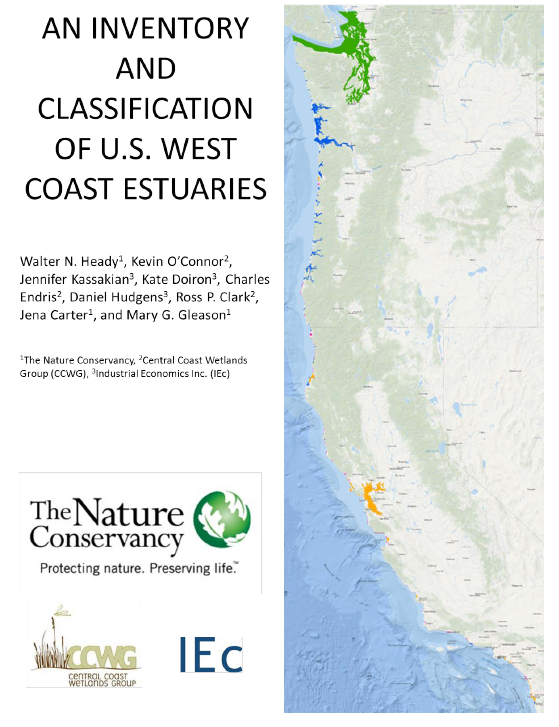 PMEP developed a comprehensive inventory of U.S. West Coast estuaries. PMEP and its partners compiled information from previous inventories and also included additional estuaries identified through National Wetlands Inventory (NWI) and aerial imagery. PMEP developed this inventory and geodatabase with the understanding that although this is a much needed first step to guide management of these valuable resources, it is simply the first step. PMEP intends for the geodatabase to be a living database and to be updated and improved upon through time.